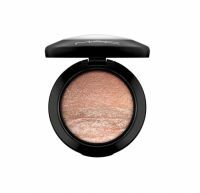 It has good pigmentation, really lasts and doesn't end up in the crease of your eye. It looks kind of like a cream but goes on more like a creamy, thick powder shadow. Very pigmented and easy to use. I love how bright and vibrant the red side is, very pearlescent and deep. The purple is pretty, more like a med. amethyst shade. The purple has some glitter-like shimmer in it, it's a little noticeable, but not overly sparkly or chunky. Very attractive looking product, too. I would de...read morefinitely repurchase this product. This was the product that really started my MAC addiction. there are some reviews on here that say the red does not show up true to color - but it does! it just has to be applied a certain way. First of all, use a dark base (i personally use the brown cream liner all over the lid from l'oreal HIP collection), and then apply the red WET over that. put some sketch (mac shadow) in the crease, and i have a red smokey eye - true to the color in the pot. i also get complients one after another whenever i wear this look, it is both a bright look that gets attention but is still smokey and alluring. I always stayed away from red when i bought makeup.. but I just had to get this after looking at reviews. The red didn't show up like it appeared in the pot [thank god]. I thought it would turn on blood red but it's totally not ! The red is a mixture of.. red/orange/copper.. it's a really pretty color.. this changed my view towards red eyeshadows. I love the red.. however the purple.. i'm a bit disappointed.. it's not as purple as i thought it would be.. it's a sparkly lavender light purple color.. which i was not excited about.. and it was lacking some pigmentations. A downfall on this product are the sparkles.. it's all over the place when applied!.. even with a very good primer.. you need to be careful when applying this product.. don't go too much or your whole face will have sparkles. If you're not sure how to wear this.. it looks great by packing in the red first on the lids and blending the crease with the purple for a very cute look. When I first saw this product online, I thought, "Red and purple eyeshadow? Hmph! That's one I can pass on!" Not so. I heard one too many raves about how stunning the red side looks when worn over Queen's Sin lipstick, which I already love. So, in late November 2007, I ordered Mi' Lady before it could sell out. Am I ever glad I did! This is my first Mineralize eyeshadow purchase, and now I think I understand what all the fuss is about. I'll review the two sides of Mi' Lady separately: RED:Yep, this is *red* eyeshadow. True red. Even more unique is the gorgeous red shimmer it has. It's somewhat like the color of New York Apple lipstick, only redder. I dabbed some over Queen's Sin, and WOW! It looked like I had a lips-shaped ruby on my face. This look might be too much for every day, but it will be great for special occasions. VIOLET: Although very beautiful, the violet side of Mi' Lady is somewhat less unique than the red side. I agree with the previous reviewer that it's similar to the color of Violet pigment. BOTH SIDES: Mi' Lady comes in an oversized clear-domed mirror-less compact. You get a very large amount of product for the price,$16.50 USD. The shadows themselves are silky smooth, well-pigmented, and very sparkly, though not garishly so, IMO. I'm even beginning to wonder if I should go for Family Silver before it's history. I had a duo of these in black and blue colors and let me tell you, they were VERY pigmented! i only needed a little amount of eyeshadow to cover my eyes because of the intensity of the color. these shadows have a somewhat shimmery finish, which is very nice. i know these eyeshadows will last me a long time since i dont use too much of it at once. they are easy to blend and super silky. i love them!